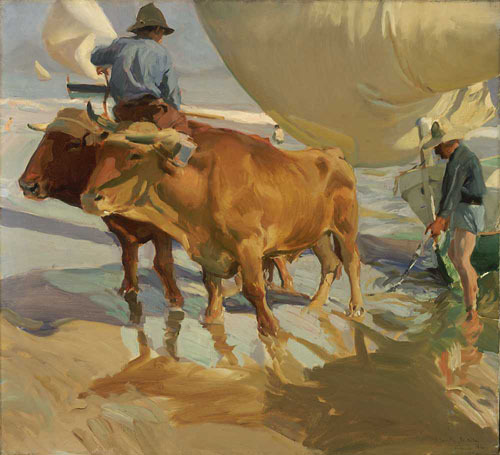 Beach scenes, featuring the effects of bright Mediterranean sunlight on sand, water, and figures, are among Sorolla’s most popular and admired works. Further up the coast, wind fills the sails of additional fishing boats. Two swimmers enjoy the shallow-water waves as they come onto the shore. The oxen driver faces backward to keep an eye on the boat as it is dragged from the water. The web sand at the oxen's feet gives a mirror-like reflection of their legs and the blue sky above. The sunlight highlights the ox's powerful muscles. One fisherman is working with the ropes used to hitch the ox team to the sailboat.